Emergency workers walk outside a Waffle House restaurant Sunday, April 22, 2018, in Nashville, Tennessee. At least four people died after a gunman opened fire at the restaurant early Sunday. A Nashville judge has revoked the $2 million bond set for the suspect who allegedly gunned down four people at a Waffle House restaurant early Sunday. The Nashville district attorney's office says it was "inundated with calls" from people outraged that Travis Reinking may be back on the streets. "The fact that he might be able to bond out set that fear and panic back in their hearts again," a spokesman said. A night court magistrate set bond for Reinking, hours after he was arrested Monday. Legal experts say it is unusual for bond to be set for such a serious crime without a bond hearing or other procedures. The 29-year-old was reportedly wearing a green jacket and nothing else when he began firing an AR-15 semi-automatic assault rifle outside a Waffle House restaurant near Nashville. When he began shooting inside, Reinking aborted his attack and ran when customer James Shaw Jr. wrestled the rifle from him — an act authorities described as heroism. "We do not know why he went into Waffle House," Metropolitan Nashville Police spokesman Don Aaron said Monday. But Nashville police chief Steve Anderson said Reinking came into the restaurant with a "lot of firepower," carrying four weapons. Two guns were found at the scene. 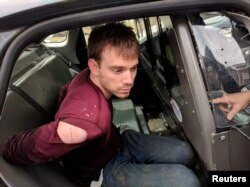 Travis Reinking, the suspect in a Waffle House shooting in Nashville, is under arrest by Metro Nashville Police Department in a wooded area in Antioch, Tennessee, April 23, 2018. Reinking has a history of abnormal behavior. Police records show he was arrested in July 2017 for trying to enter White House grounds, prompting authorities to revoke his gun license and seize four firearms, including the rifle that was used in the Waffle House killings. Police gave the guns to Reinking's father, who told them he would keep them away from his son. But police said Sunday the father returned the weapons to him. U.S. Bureau of Alcohol, Tobacco, Firearms and Explosives agent Marcus Watson said Reinking's father, Jeffrey, could be charged with federal crimes if he knowingly gave weapons to someone who was prohibited from owning them. Jeffrey Reinking was not immediately available for comment. Sunday's massacre was the latest in a series of mass shootings in the United States in which a gunman used an AR-15 style rifle. One of the most deadly massacres was carried out on February 14 at Marjory Stoneman Douglas High School in the southeastern city of Parkland, Florida, a tragedy that sparked a nationwide movement for tougher gun control laws. The suspected shooter was a former Marjory Stoneman student who was also brandishing an AR-15.